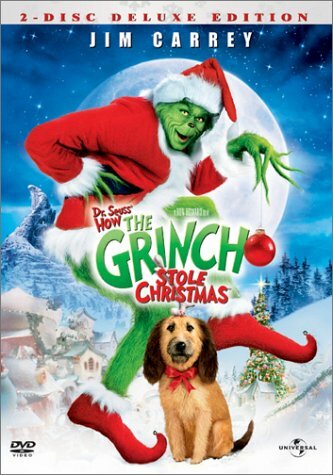 The Grinch is now available on DVD! "HOW THE GRINCH STOLE CHRISTMAS" & ALL RELATED MARKS & MEDIA ARE TM & © 2000 IMAGINE ENTERTAINMENT. NO OTHER OWNERSHIP IS IMPLIED. THIS SITE IS IN NO WAY AFFILIATED WITH ANY ENTITY INVOLVED IN THE PRODUCTION OF THIS MOVIE. ALL OPINIONS CONTAINED HEREIN ARE THOSE OF THE AUTHOR(S) ALONE. ALL PICTURES AND OTHER MATERIAL WERE OBTAINED THROUGH APPROVED CHANNELS OR FROM THE PUBLIC DOMAIN AND ARE NOT INTENDED TO INFRINGE ON ANY COPYRIGHTS. CLICK HERE TO VISIT THE OFFICIAL SITE.